Whether you’re a coffee or tea drinker, mugs are a fun and vital tool to help you enjoy your drink. We did the research to find mugs made in the USA and handpicked the best ones for their excellent level of quality, high attention to detail, and good overall craftsmanship. We love these mugs and can confidently say that they are some of the best coffee mugs made in the USA today. With so many different pottery companies in the USA today, choosing leading mugs isn’t as simple of a task as it seems. We took the time to compare mugs from leading brands all over the country, and looked at things like materials used, mug styling, environmental impact and overall cost to help us choose the best of the best. We split our selections up into different section types, making it easy to find an ideal mug whether you want a custom creation, an insulated mug, a brightly colored option, or something else entirely. Read more about each of our choices down below. Below are tons of additional details about each of our top picks – extensive product details, what we liked, and what we didn’t like. These American Mug Pottery ceramic coffee mugs offer a fine mix of thick walls, vibrant colors and careful sizing for an excellent Bistro-style drinking option. They are a durable drinking solution that’s made in the USA from quality materials. We love how thick and solid the mugs are and they offer good reliable insulation for hot drinks for this reason as well. 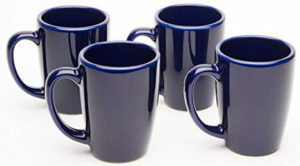 The mugs are in a bright cobalt blue color that stands out, but they have a classy color to them. These ceramic mugs are sold in a four pack, and each one is an ideal 14 oz. in size to the very top. They hold a single cup of coffee and work well to keep it warm during consumption. We like the look and feel of these mugs and prefer them to the thinner ceramic mugs that are commonly sold today. 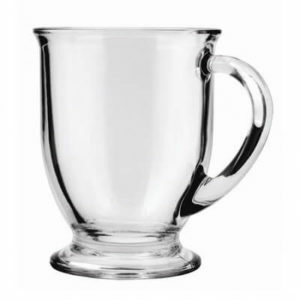 Anchor Hocking is a premium name in dishes and is known for offering durable and high quality products, and these glass mugs live up to the reputation. These Anchor Hocking café glass coffee mugs made it on our list because they are made from thick glass that’s durable and perfectly clear. We love the wide base of these mugs because it really adds to stability during use. The mugs are slightly oversized and hold a total of 16 oz. which will be too large for some, but perfect for heavy coffee and tea drinkers. They are microwave and dishwasher safe, and have a good neutral appearance that goes well with any style. Tervis is a popular mug and glass company founded in Detroit, Michigan and based in the USA still to this day. The company offers thousands of different glasses, cups, and tumblers and the Tervis insulated mugs are one of the best products that they have to offer in our opinion. While testing these mugs and tumblers we were impressed with their thick and sturdy feel, and their ability to keep liquids hot or cold. Each of these mugs is made from a thick BPA-free plastic, and they are heavily insulated to prevent heat transfer and condensation during use. 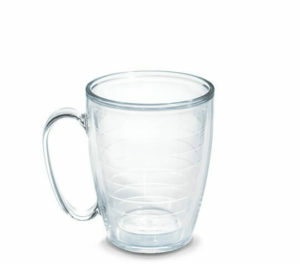 The cups come in a variety of sizes and colors, but we prefer the clear 16 oz mug for use when not travelling. This mug offers around 12 to 13 oz. of drinking capacity and will keep coffee warm for extended periods. These mugs are highly durable and make good traveling companions when you get one of the tumbler-style containers without any handles. As one of the oldest stoneware companies in the country, Louisville Pottery offers professional grade mugs that are unrivaled when it comes to quality. The Louisville Pottery Collection 14 oz. mugs are nice and thick and solid in the hand, which makes us feel really secure when holding them. These mugs insulate really well thanks to their thick form-factor, but the handles stay nice and cool during use. They offer a 14 oz. capacity, which is the perfect size for a good full cup of coffee. We were impressed by the quality of the glazing on the outside of these mugs, giving them a nice smooth feel in the hand, and we liked the different pattern options available during purchase. They are 100% made in the USA and crafted from quality materials designed to last. 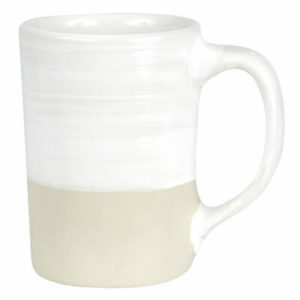 We love the look and feel of the Go Green Earthware Classic mug offered by Emerson Creek Pottery. This thick weighty mug is handcrafted near the Blue Ridge Mountains in Virginia and is 100% made in America. 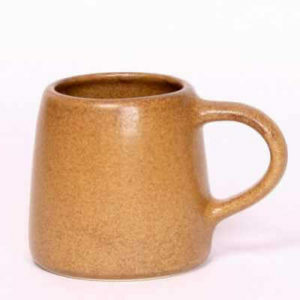 The mug has an earthy brown tone to it, and offers a 12 oz. capacity that’s ideal for use with coffee. The mug features a wide handle for easy holding and is a good solid option for those that are environmentally conscious. The mug is made from all-natural ingredients and does not make use of any chemicals at all. It’s also dishwasher, oven and microwave safe for convenience. It’s one of our top recommendations for use at home or the office thanks to its tough design and small environmental footprint. 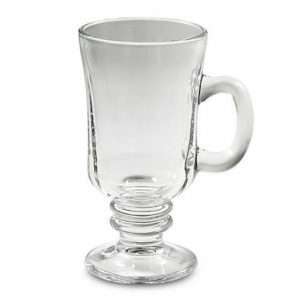 There’s something quite alluring about Irish coffee mugs that we particularly like, which is why these Libbey Irish mugs made from tough tempered glass are on our list. The mugs come in a set of four, they look crystal clear, and they feature wide bases designed for maximum stability. Each of these mugs has a 10.5 oz. drinking capacity, making them well-suited for both coffee and tea. Libbey specializes in ultra-tough glasses. Through a special treatment process, the mugs sold at Libbey are made to withstand temperature shocks and impacts better than standard glass. These mugs are exceptionally tough, which gives us some security when using them while out and about. We also love the way these mugs feel, they have a substantial heft to them and are nice and thick so you know they’re going to hold up to abuse over time. 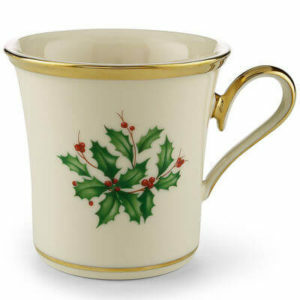 The Holiday Mug by Lenox is a beautiful piece to add to any home. The mug is made from striking Ivory bone china and it’s accented with bright 24 karat gold banding. We love the way this mug looks, and feel like it’s one of the most functional pieces of décor that you can add to your table around the holidays. These mugs have a thin delicate feel to them, but offer a comfortable handle that’s perfect for holding during use. The mugs offer 10 oz. of drinking capacity that works particularly well for tea and other holiday drinks. Lenox is a well-known American china company with beautiful pieces used by the American government and appearing in all sorts of Museums around the country. These mugs are the perfect balance decoration and effective performance. They feel good in the hand, and although they are a bit thinner than we like, they hold heat well during use. American Mug & Stein Co.
Stock mugs are just fine for everyday use, but there’s nothing like the personal feel of a hand-crafted custom mug. We prefer the mugs and steins produced at American Mug & Stein Co. for a few different reasons. These mugs are tough and weighty and have a nice substantial feel to them, which we love. They come out glazed and finished for maximum durability and hold up really well during use. The mugs are also highly customizable. Mugs are available from 10 oz. up to 16 oz. in size, and it’s simple to get just the right capacity that you are searching for. If you have a custom mug that you want created, with a specific logo, color or lettering, this should be your go-to. Smaller is better, big mugs lead to cold coffee unless highly insulated. Choosing a size that’s one good cup of coffee is usually the best policy. Coffee mugs come in different shapes and sizes and we’ve examined many different sizes to determine what works best. For office or home use, handled mugs are the most comfortable and convenient for use. For on-the-go use, a mug that’s free from handles and narrow enough to slip into a cup holder is best. Nobody wants their piping hot coffee to get cold before they drink it, which is why insulating properties are so important. 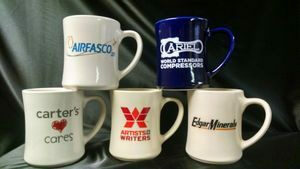 We looked for thick materials, mugs with lids, and mugs designed specifically for top quality insulation. When searching for the best coffee mugs made in the USA, we have to take the time to focus on style at least a little. After all, style is a key element of any good mug. We looked at popular mugs that are deemed stylish by thousands of owners, and used them as a guide on which styles to select for our top mugs. They offer plain colors, stylish prints and some unique looks to give you a mug you can be proud of. In our experience, the material that a coffee mug is made from is extremely important. The wrong material can leave you with a bad taste in your mouth, and fail to offer the necessary insulation to make drinking your coffee comfortable and enjoyable. We prefer ceramic mugs at the top of this list because they are durable, insulative and don’t retain flavors. Glass is another excellent option, but go after a thicker material for strength. Stoneware and stainless steel mugs are worth considering as well, but stoneware tends to hold flavors a bit more than the others. Be careful to avoid plastic and porcelain when you can, because they are well-known for retaining flavors in-between uses. Let’s face it, coffee mugs are daily drivers for most owners. If you’re going to be bringing a mug with you everywhere you go in the morning, you want it to be tough. We prefer stainless steel above all else for durability. Thick ceramics and glass mugs also do well in this regard. Options like porcelain and thinner ceramics or glass mugs break easily and aren’t reliable. We want to make sure you’re getting the best mugs for your money. That’s why we eliminated several companies from contention where we felt like their quality didn’t live up to their price tag.